I do't know if this shot is genuine or not. 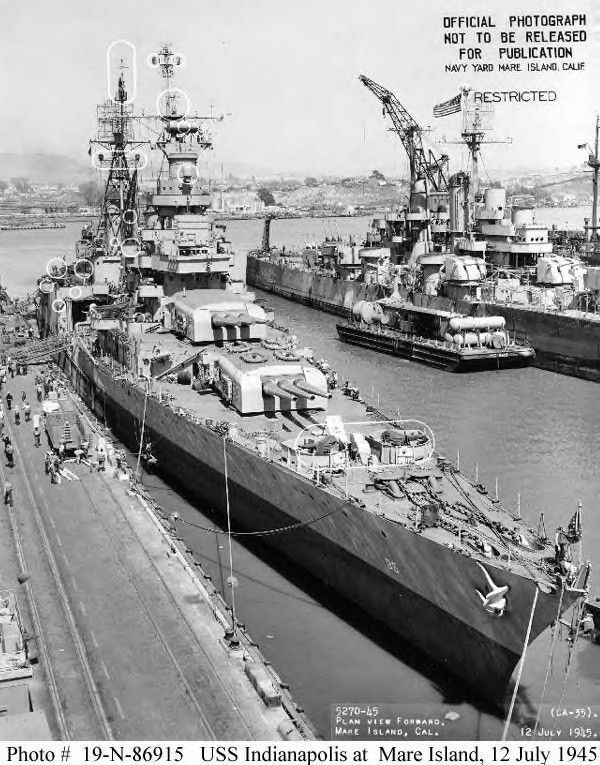 This is reprinted from Naval History and Heritage Command. Casual readers may not run across it there, but it deserves to be read, so here it is. My USAAF father had Nuclear Clearance at the time, which was uncommon, and worked on peripheral matters related to the Manhattan Project. Thus, this incident is of particular interest to me. 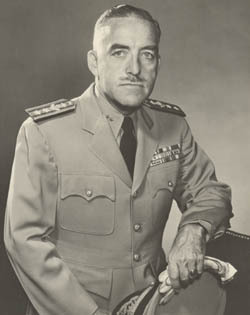 Rear Admiral Charles Butler McVay III (July 30, 1898 – November 6, 1968) was the Commanding Officer of the USS Indianapolis (CA-35) when it was lost in action. 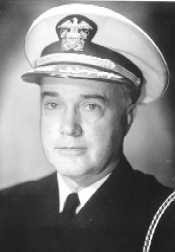 He was the only commanding officer of a warship in the history of the U.S. Navy court-martialed for negligence resulting in the loss of his ship during wartime. 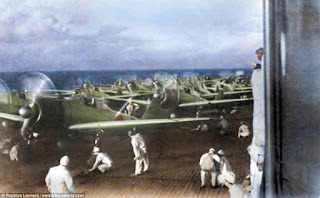 After refueling at an eerily quiet Pearl Harbor, we made a straight run to Tinian at as much speed as they could economically go, about 25 or 26 knots. Everybody was at Condition Able which was 4 hours on and 4 hours off. It was like going into battle the whole way out. The trip from San Francisco to Tinian took a total of 10 days. 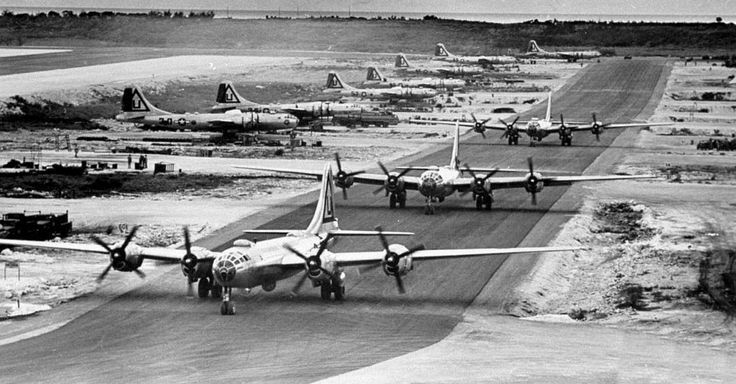 The B-29 base at Tinian. 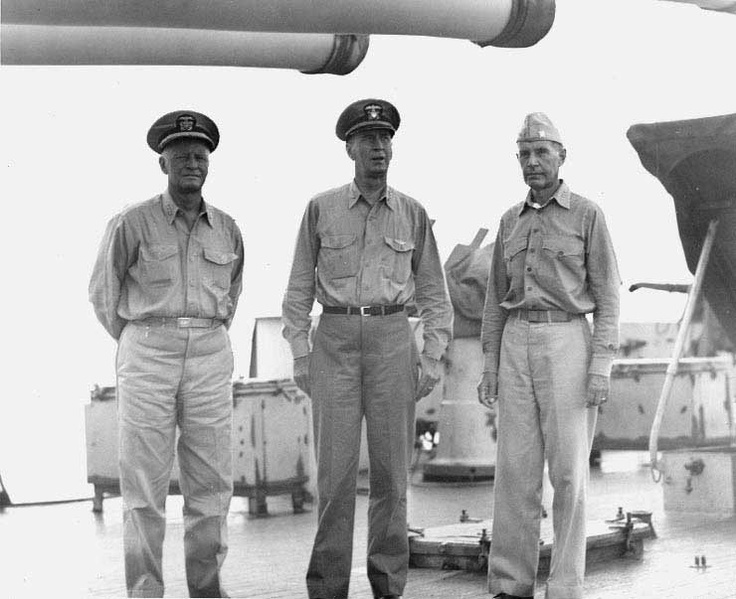 Admirals King, Nimitz, and Spruance aboard USS Indianapolis,18 Jul 1944. 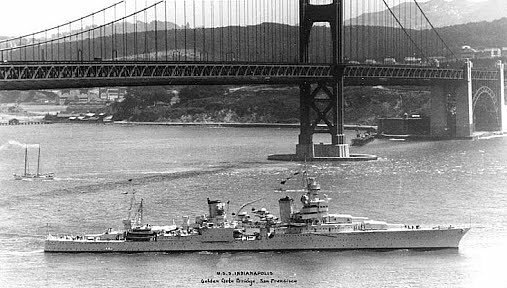 I-58, which sank the Indianapolis. Japanese Lt. Cdr. 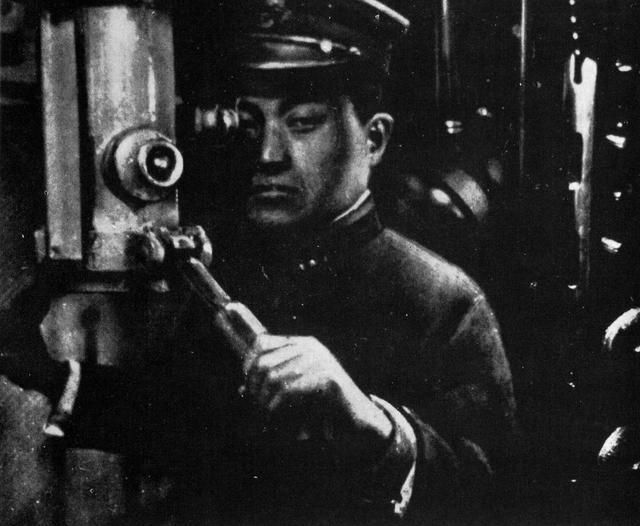 Mochitsura Hashimoto at the periscope of his submarine, the 1-58, which was responsible for the sinking of the USS Indianapolis. 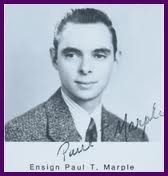 In memory of Paul T. Marple, Ensign, who lost his life aboard the USS Indianapolis. 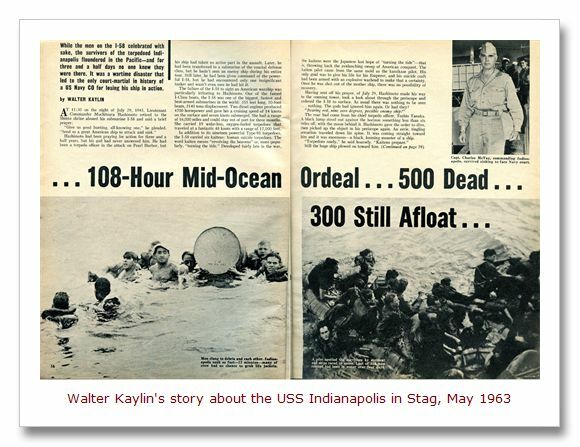 Vincent Fast Horse, Lost at Sea, USS Indianapolis. 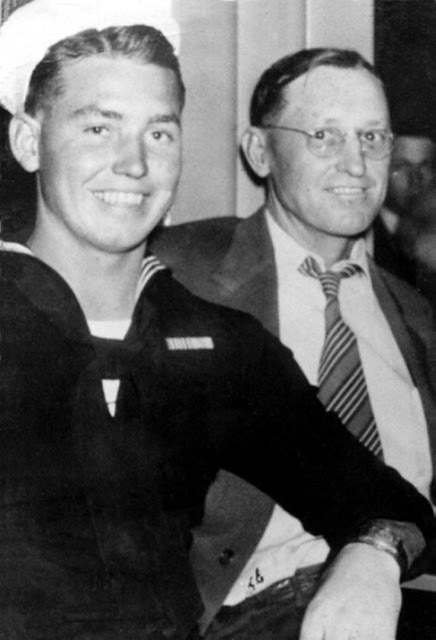 He attended Red Cloud School which is on the Lakota Sioux Reservation. 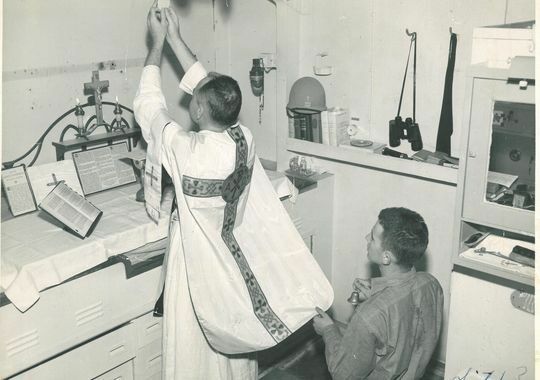 Lt. Thomas Conway says mass on the USS Indianapolis. See next photo. 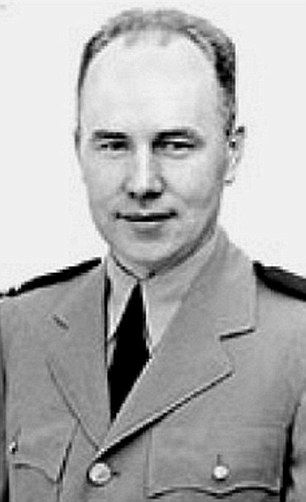 Lt. Thomas Michael Conway, a Catholic priest from Buffalo, New York a heroic chaplain who died while ministering to sailors in shark-infested waters after their ship was torpedoed during World War II. 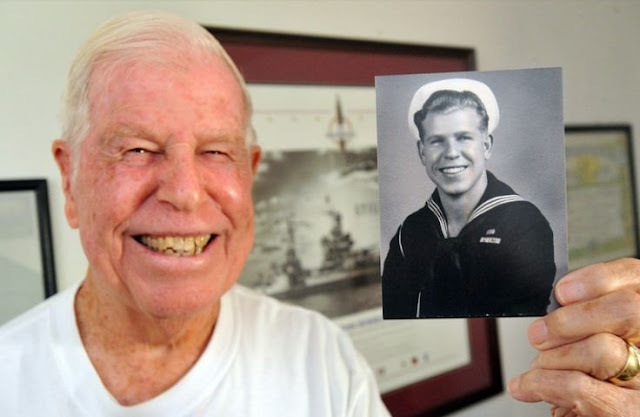 The U.S. Navy recently rejected awarding him a posthumous Navy Cross medal. 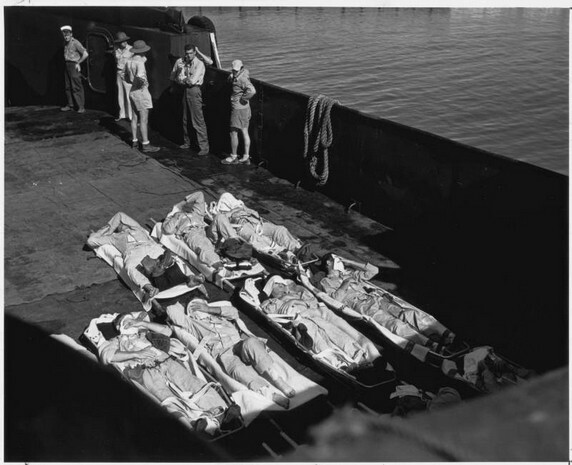 There was nothing I could do but give advice, bury the dead, save the life jackets, and try to keep the men from drinking the salt water when we drifted out of the fuel oil. When the hot sun came out and we were in this crystal clear water, you were so thirsty you couldn't believe it wasn't good enough to drink. I had a hard time convincing the men that they shouldn't drink. The real young ones -- you take away their hope, you take away their water and food -- they would drink salt water and then would go fast. 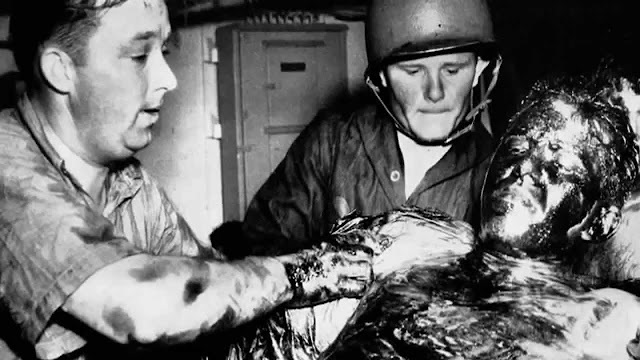 I can remember striking men who were drinking water to try and stop them. They would get diarrhea, then get more dehydrated, then become very maniacal. In the beginning, we tried to hold them and support them while they were thrashing around. And then we found we were losing a good man to get rid of one who had been bad and drank. As terrible as it may sound, towards the end when they did this, we shoved them away from the pack because we had to. 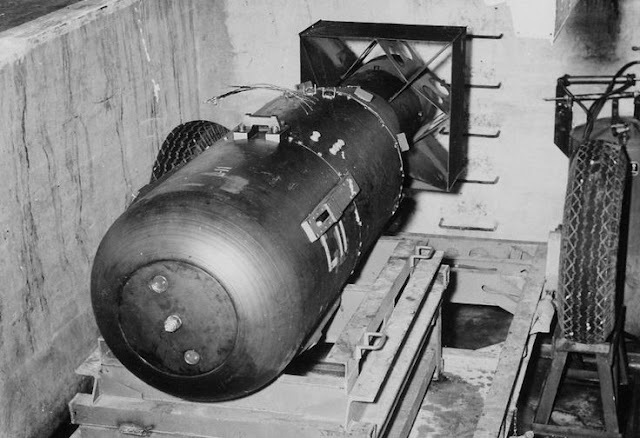 "There's a Jap here and he's trying to kill me." And then everybody started to fight. They were totally out of their minds. A lot of men were killed that night. 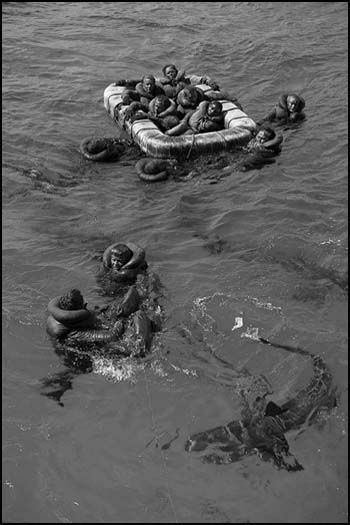 A lot of men drowned. Overnight everybody untied themselves and got scattered in all directions. But you couldn't blame the men. It was mass hysteria. You became wary of everyone. Till daylight came, you weren't sure. When we got back together the next day there were a hell of a lot fewer. 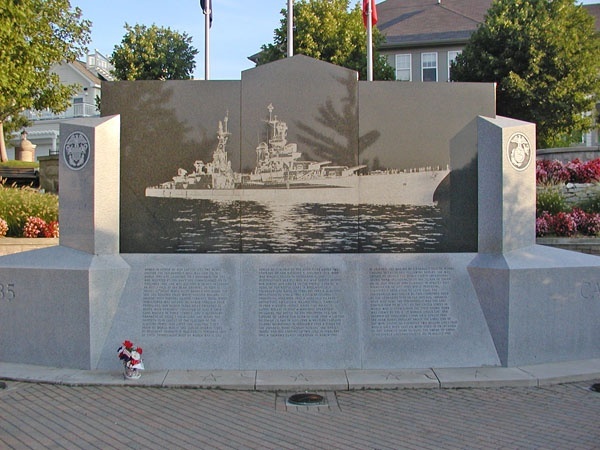 Lt. Adrian Marks, a resident of Frankfort, Ind., was largely responsible for the rescue of 56 survivors of the cruiser USS Indianapolis. 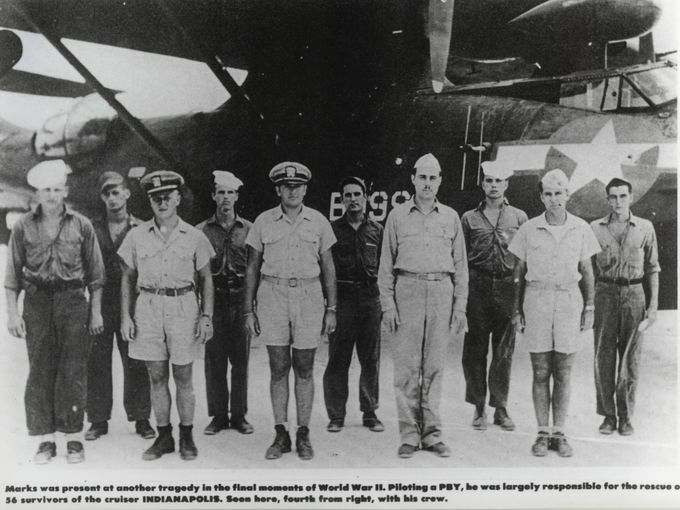 Marks is seen here, fourth from right, with the crew of his PBY Catalina. 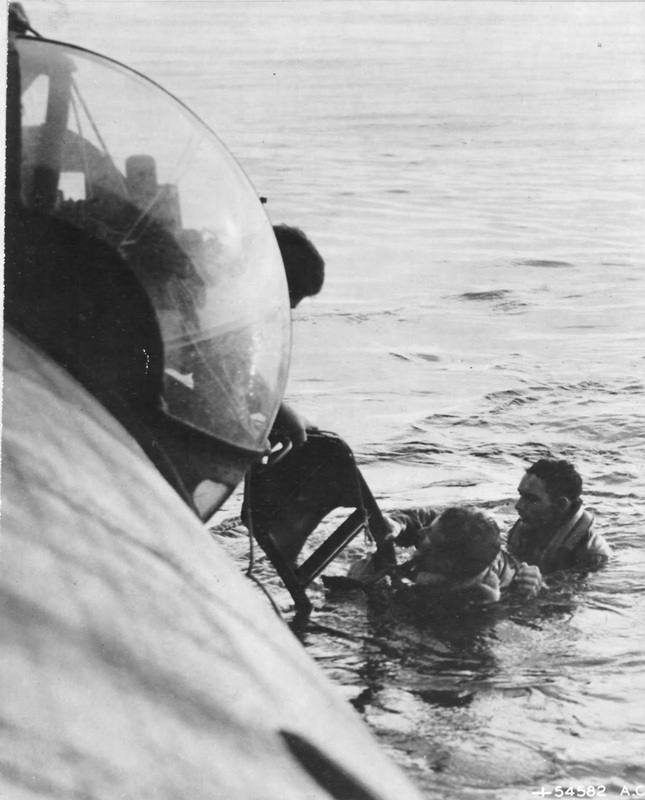 A PBY Catalina picking up men at sea. 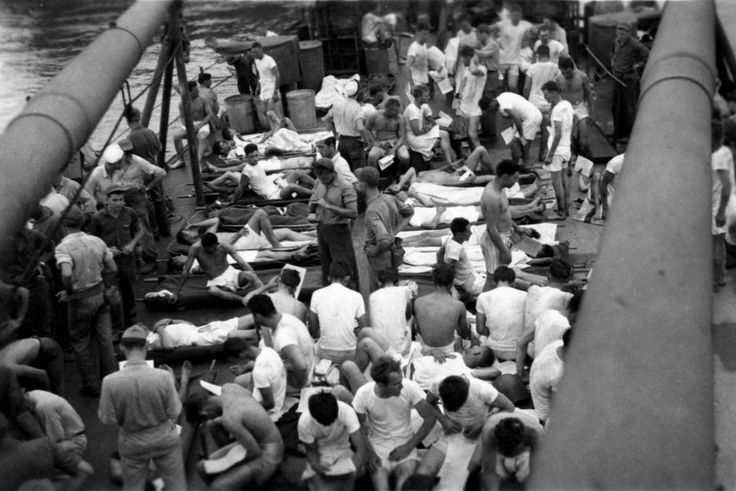 USS Indianapolis - Survivors on the deck of the USS Bassett, rescue vessel. 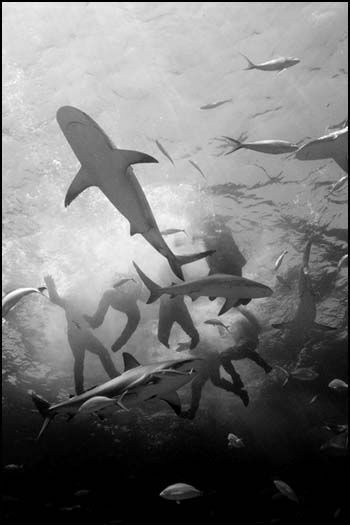 Shark attacks began with sunrise of the first day and continued until the men were physically removed from the water, almost five days later. 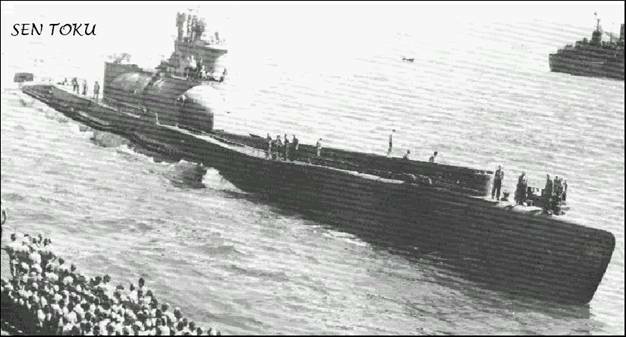 Known as the worst martime disaster in U.S, Navel History. 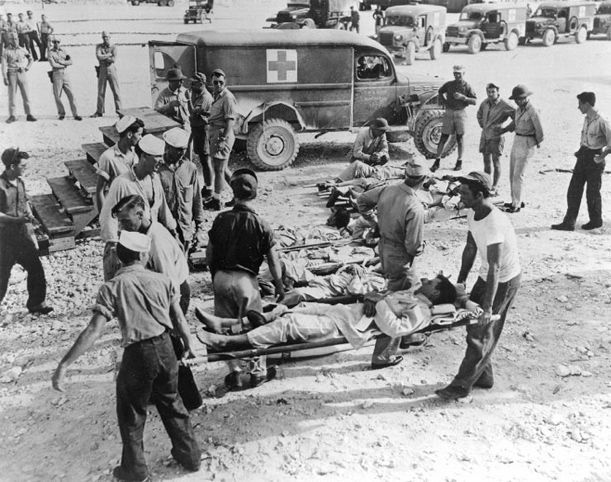 Survivors of the USS Indianapolis (Sunk by a Japanese Sub On July 30, 1945) are taken to medical aid on the island of Guam. 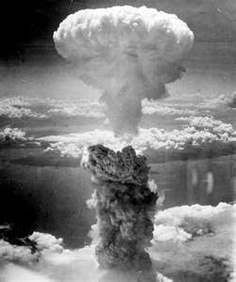 Photo from Wikipedia Commons.